The court battles of Apple and Samsung are quite heavily discussed these days. The latest ruling has granted Apple injunction preventing sales of Samsung’s Galaxy Tab 7.7 in the whole EU! With different reasons, this latest case has particularly raised the curiosity. One of such reasons is that with the recent release of Nexus 7, the ASUS-manufactured Jelly Bean device, Apple has got the right to prevent quite a low number of unit sales. Moreover, the decision of the German judge is completely in contrast with the last week’s UK ruling, forcing Apple to issue a series advertisements saying “Samsung Didn’t Copy The iPad.” This is for clearing its bitter rival of any wrongdoing. For those unaware, the British judge Colin Birrs assessed Galaxy Tab 7.7, 8.9 and 10.1 not to be cool enough to have copied the iPad, thus they did not infringe on any of Apple’s registered patents. 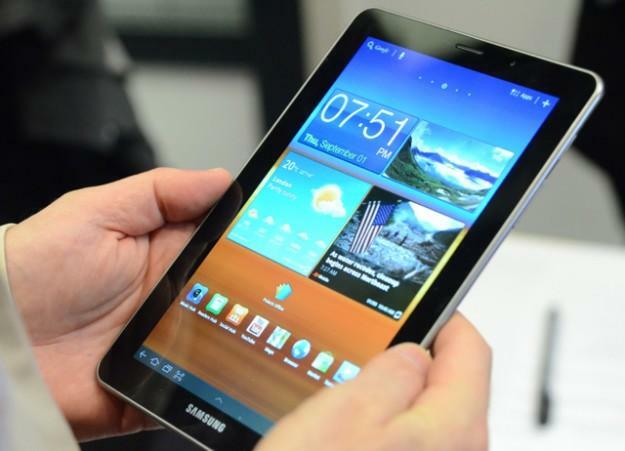 However, the Düsseldorf Higher Regional Court still decided that the Galaxy Tab 7.7 violates Apple’s iPad patent designs, while the Galaxy Tab 10.1N does not infringe the same patents. With the never ending patent war between the companies, the win over the Galaxy Tab 7.7 may seem somewhat unreasonable from the side of Apple, while analysts think it its Nexus 7 Apple should chase after. However, it doesn’t seem strange to us at all, as Apple is rumored to launch the iPad mini soon, that’s said to feature a 7” screen. With this said; the company may be preparing ground for the launch of its mini iPad. What are your thoughts? Do not hesitate to share below in the comments.